Brushing and flossing may be the most important parts of your daily routine, but are you doing it right? When it comes to oral health, quality trumps quantity. Unfortunately, even with all the fancy oral gear and cleansing equipment we have today, around 90% of us still suffer from some form of gum disease or oral cavities before we hit 30. But, it is also true, that this can be prevented by getting the basics right! The solution lies in using the right brushing and flossing techniques. 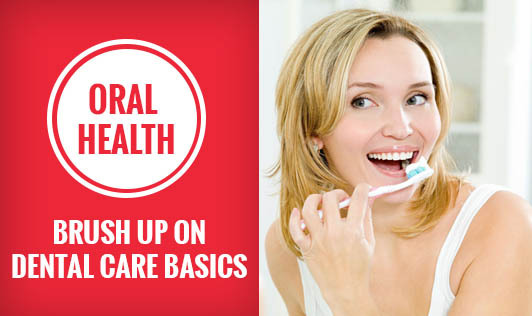 Because, oral health begins with healthy, well-maintained pearlies! Brush at least twice a day. Brushing just once can cause plaque-causing bacteria to build up in the mouth and brushing too many times can erode the enamel. Dentists recommend brushing after every meal, but brushing even twice a day (after breakfast and before bed) can go a long way to maintaining good oral health. Use the right gear. Less is more when it comes to brushing. A soft-bristled toothbrush, with a medium-sized head and a fluoride toothpaste are the only tools you will need. That said, there is no denying that an electric toothbrush, helps to clean more efficiently and also reduces plaque and gingivitis, a mild form of gum disease. It all boils down to technique! Hold your toothbrush at a 45º angle, rather than at 90º. This helps to clean the gum surface- the area that is more likely to get infected in adults. Use a soft rotating action and focus only on cleaning two teeth at a time, since that is all your toothbrush can cover. Don’t forget to brush your tongue before rinsing. Maintain a clean station. Always rinse your toothbrush post-brushing and place it in a clean and dry area, uncovered, and at least 6’ away from the toilet, in order to prevent contamination by airborne particles resulting from flushing. Know when it’s time to throw out the old and get a new toothbrush. This should happen every three to four months. The same time period applies to electric toothbrush heads as well. Now that you got the whole brushing game down pat, let’s focus on the other half of good oral health- Flossing! This activity helps to remove trapped food particles that brushes generally tend to miss. It is important to floss before you brush in order to gain the maximum benefits from the brushing activity that follows. Don’t skimp on dental floss. You will need at least 18” (46 cm) of dental floss, most of which should be wound around the middle fingers of both your hands. Grip the rest tightly between your thumbs and forefingers. Be gentle. The right way to floss is to use a slight rubbing motion between the teeth instead of snapping the floss right in. Once the floss touches the gum line, curve it off against the tooth. Focus on one tooth a time. Slide the floss between the teeth and gently rub up and down, off the side of each tooth. Use a fresh piece of the 18” floss for each tooth. Use a floss-pick if you are not doing it right. If you find it hard to floss the traditional way, take advantage of the new floss-picks or interdental cleaners available at pharmacies and drug stores.